First, note that money is always tied to some scarce resource everybody is willing to obtain (except for Franciscan monks). This resource was historically gold or silver, later it was replaced by obligations (bank notes) issued by the state. The transition to banknotes was quite rough, since many governments misused the trust and printed money in arbitrary quantities to cover expenses. Nowadays, governments have learned to issue banknotes so that they still remain scarce and attractive, the only exceptions are countries in the war or otherwise unstable. In any case, this resource is circulating. In the medieval times, people tend to save money in home. As a result, a considerably large amount of resources were in reserve (nobody did not provide services for that). Then the church and society changed its opinion on loans. In early medieval times, the loaning out of money was a sin, since it allowed persons to trade with "time" (as you could afford things before you actually owned enough resources to buy it). As the social attitude changed, more and more people started to lend out their accumulated resources. As a result, the economy was boosted---more resources were exchanged in the market and thus there was an initiative to produce more "goods". and gave back a loan notices. Each person with this loan notice (cheque) could come to the banker, who would then give a money in return to this cheque. Of course, the banker knew that not all persons come at the same time. Hence, he could lend out a considerable amount of money and make profit from it. From an evolutionary viewpoint, this was another enhancement in economy, since the amount of resources out of active use decreased. Now all persons in the bank collectively acted as loan givers and thus could release more money from their collective resources than they could individually do. So far so good, but there was a caveat---at any time the total amount of resources available in the bank was smaller than the total amount money in cheques. the total amount of cheques that can be freely used to pay for the goods is always equal to the amount of money stored in the bank reserves. Hence, we can come up with a natural interpretation, the sum in a cheque is "virtual" as only a certain percentage can be used. This virtual sum has a reassuring psychological effect on people and thus they are happy to diverge large amount of their accumulated reserves into the market. As an illustrative example consider a crocked backer, which gradually moves money out from the bank reserves. If he or she is exceptionally good it might take years to discover that the money lend out (for fictional companies) cannot be recovered. During these years, some simpleminded bank clients have provided services for "faked" cheques. To put it in other terms, some simpleminded persons have sold their services under the true market price, since they have not discovered the fraud. In particular, close friends and relative of bankers, who know that banker moving money away, can change their "fake" cheques for goods. As such they are deliberately participate in the fraud. then we face danger to sell goods under the market price. As such any bank account balance is "virtual". It contains larger sum than is actually available ("we trade with future"). If we as bank account owners act rationally and banker is honest, then everything works out fine and the amount of actively used resources is near-optimal. Of course, nowadays the bank does not issue cheques. Instead, it offers you debit and credit cards and online payments. Nevertheless, the meaning of your bank account is the same. Do not let bankers fool you. The bank account does not actually reflect the amount of money you can use. We get away with this only because as group we act rationally. If panic breaks then the the slowest are robed by the fastest (act of natural selection). OK, let's do some bit of public flood. My view has certain questionable points, which I brought up explicitly. So does yours, but you kept quiet, so I bring them out to be fair. Firstly, your first sentence is really flawed. Neither gold nor silver nor any other resource was ever something that everybody was willing to obtain. It is precisely the opposite: the social contract that defined these things to be money made everyone want to obtain them. The society is free to define whatever it wishes, including the bank cheques (as it does now in practice). As a result of this "money as a resource" view of things, you can't really clearly answer the question who and why issues money. You believe that the amount of money in circulation needs to be fixed from the above by the number of printed notes. Well, then, imagine a national bank in Veggieland (at the times when no one wanted to trade). Suppose the bank prints 100 banknotes and fixes this amount for a year. What now? Who should get these in the first place? When and why should the bank decide to print more? I find these questions crucial in understanding the meaning and definition of money and discerning it from an arbitrary "resource". Not being able to answer them (as it seems to me) makes your theory somewhat useless. Secondly, the statement that you can only use part of the money on your bank account is flawed. Although the money on my account is just a database entry with no real cash "corresponding" to it, is not "virtual" at all: I can use it in full at any moment by transferring it to you, no cash needed. I do agree that there is no strong legal basis currently, supporting electronic currency. It is a just working de-facto contract, supported only by the law, stating that "The nation's monetary system is a two-level system". It is difficult to legally establish electronic currency, because it would basically prevent any commercial banking services, which would mean an unconvenient service monopoly. However, this still a reasonably minor flaw, because the current system works (not unlike lots of other various de-facto social contracts). There is a simple hypothetical solution to the situation where everyone suddenly decided to extract cash from an otherwise trustworthy bank: the state needs to temporarily require everyone by law to accept wire transfers from that bank as a legal trade tender. This would immediately secure the social contract for that particular bank's e-currency legally. Of course, due to various political and psychological issues, the solution is probably purely hypothetical. 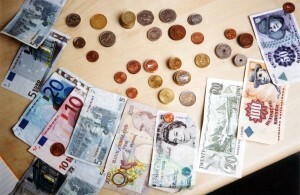 Note that the number of banknotes has nothing to do with the amount of goods that can be produced, sold or traded. If there are only 100 bank notes, then the society can still achieve GDP 100,000. It just means that on average each bank note is changed between buyer and seller 1000 times. 3. In the era of banking, the number of actively used banknotes is 80. Reserves are more optimally used. To recap, the total amount of banknotes determines the maximal number of reserves people can collect as monetary units. If 100 banknotes are issued then only 100 banknotes can be staked away (The socially tolerable amount of future promises). Nowadays the state does not have to guarantee so many future promises as in the medieval time, since banks make it easy to send banknotes back to the active use (You perceive your accumulated resources larger than they actually are). Ok. you can sell your goods for cheques (with bank transfer) but then you take a risk to sell your stuff under the market price (when your bank goes belly up). There is a difference between bank note and cheque, and it is crucial. A bank note is attractive if you believe in the state, a cheque is attractive if you believe into the bank. If bank collapses the banknotes remain their value, whereas if the state collapses all cheques loose their value. See the asymmetry. OK, but still, what you are speaking about here, are resources, not money. Of course, resources, similarly to money, can serve the purpose of an exchange medium and be the unit of account: it makes things really confusing. However, it is close to impossible to control the amount of circulating resources, and that is why the times of the gold standard are over. Indeed, historically, banking has emerged as a private business aimed at earning money. However, nowadays private banking is a crucial, legally established component of the economical system for any modern state. Economics itself would be close to impossible without loans. The reason for that is that loans allow to dynamically control money supply according to the amount of economic activity. It is quite normal that you have to trust the party emitting money. The fact that money emission is spread over several banks and you really have the choice of who do you trust does not really support the idea that the only "real money" is the one printed on paper (by the way, did you know that it's actually cotton). I might agree that cash can be somewhat less risky in some cases, but then you need to have a very good safe. Finally, do think about how your "money is a resource" framework can tackle the really important questions of how much money should the state print and who should get this newly printed money. I'd say it simply can't. Ok lets answer your questions one by one. -- the governments could have created an extra tax and redivided the resulting money to the need reforms. -- the government could untie the banknotes form gold and print out new money. Note that both choices would have resulted in the same economical effect redivision of social wealth. As the new money was printed, the actual value of accumulated banknotes was moved to the newly printed banknotes. In other words, the government robbed rich to help poor. Obviously, the second choice was much more rational for politicians, since most people do not psychologically feel the effect of the second measure and start to undersell their goods. The relative flexibility made this a dominant way to redivide money if needed. Again, a good sign of social-economical evolution. Now coming back to the question how much banknotes the government should issue. Under the assumption that redivision of wealth is solely done by taxes (no crises) the amount of banknotes should be such that money remains scarce and attractive. The simplest is to keep it constant. Then the amount of goods you get for single unit might increase if the advancements in technology occur. Hm, that was quite insightful, but I feel that you have now moved out into a completely different field of social policies. I find this topic rather unrelated to the basic function of money as the medium of exchange, and all of your last ideas apply as well regardless of whether you consider my view or yours. Technically, what you are saying, is that a state that issues money must necessarily perform social functions of redividing wealth, because your explanation of how to distribute newly emitted money necessarily leads to redistribution of wealth. The state can use monetary policy to redistribute wealth, but in theory, it need not at all. Redistribution of wealth is not the function of money per se. Now to your idea of a fixed money supply. Note, that if the money supply is fixed, as you propose, and people have no way of increasing it (i.e. loaning money), you would end up in a situation, where most people will be unable to start a profitable business simply because they wouldn't have the initial capital. Moreover, most people won't even be able to afford a living space. As a result, the economy would function significantly less efficiently. There will be no general way of making "promises" and deferring payments. Consider the worst scenario of some rich guy taking nearly all the cash to himself by selling lots of stuff in a single shot: such a case will lead the state to the situation where no trade can be done at all. What this means is that a fixed money supply (or, in other words, your money = resource view of things) is an approximation to a pure barter-economy with no money at all, which is not what you want if you want to theorize about the meaning of money. 3. dynamic money supply via two-level banking and loans. If we some day reached the idealized case I described in the post, that would be level 4. Ok. For goodness sake assume that a government has committed to fixed amount of money policy (which is socio-economically sub-optimal, as it makes redividing money politically difficult). Let us consider two scenarios: stable and radical. In the stable situation, the amount of goods produced per year grows constantly in steady rate (2% per year). Since the amount of money stays constant and the amount of goods has grown, then obviously the balance point moves up an people are willing to give more goods for single banknote as it is more scarce than before. We have a revalvation. As a result two things happen: the prices and salaries go down. Since things cost less a company cannot pay so much salary. As a result, one cannot save so much money as before and the money does not go to the reserves any more. Instead, people are going to use their old savings, as they want to take out winnings coming from the revalvation. As such the system stabilizes so that price roughly reflects the amount of time needed to make the product. The standard solution is to print more money so that the prices were always roughly the same. As explained above the process redivides wealth so that the value of older savings are transfered to new bank notes. This is a standard inflation. From ethical viewpoint, it is pure robbery of elderly people. From socio-economical viewpoint, it is a marvelous mechanism for suppressing creation of extensive reserves. If you take money away from the market, then the government implicitly transfers the resources to new bank notes---you just cannot stash money away. However, there are limitations, if you print out too much money---redivide wealth so much that most people notice it---, then we get hyperinflation---money is not an attractive way to accumulate reserves (obviously, since government takes most of the value to newly printed banknotes). Lets now consider radical scenario, where a single person Robert has somehow suddenly gotten 95% of the circulating banknotes and he is keeping them in a big cellar. Again the system would stabilize without intervention: prices and salaries would go down until 5% money is enough for trading (linear approximation would be 20 times). The latter would create strong motivation for this person to buy goods and thus release some of these reserves (in fact the balance point would be much lower). For obvious reasons, such scenario is intimidating for politicians. Normally, they would just print more money and thus effectively nationalize a part of Robert's savings. If the government is committed to constant amount of money, it could achieve the same effect directly by confiscating x amount of Robert's wealth. This has the same effect as printing money but is politically less pleasant. In some sense, it would be much precise, since printing out more money redivides wealth of other persons than Robert. To summarize, a government can do the same economical manipulations with constant amount of money policy, but the psychological effect of these manipulations is less severe, when the redivision of wealth is done by emitting new banknotes. As such active monetary policy is evolutionary improvement. Nevertheless, the main principle that money is a scarce and attractive resource cannot be violated. The countries departed from the gold standard during the economical crisis in early thirties last century. The main reason was not that something was wrong with gold. If I undestand it correctly, one of the main reasons for that was the ascent of Keynesian economics, which in particular implied that, well, something was wrong with gold. Obviously, a private organisation should not have the ability to redivide the wealth. No, it is not obvious at all. The US Fed is a rather private organization. Also, any usual commercial bank nowadays has the ability to redivide wealth by selectively issuing loans. Swen: Government prints it and then distributes to people via its social policies. KT: People loan money in return for promises. Swen: The fact that it is limited in number and all people somewhy want it. KT: The fact that there's a real promise behind each circulating banknote (the one who loaned it promised to return the favor). What form can money take? Swen: Only cash. Everything else is an illusion. Commercial banks are evil. KT: Any currency that is issued by a trustworthy bank, measured in currency units and accepted within the country as a trade tender. 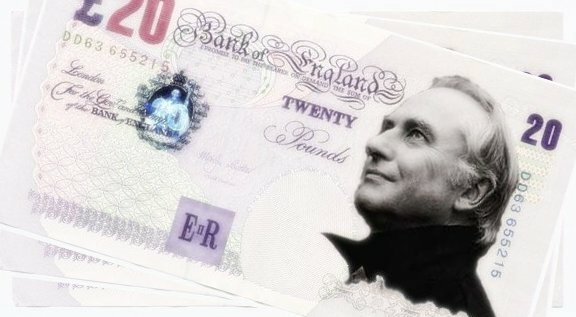 I wanted to check it out and found out that you can't easily find a high-resolution image of a British pound in the internet. Some might say it's natural, but I'd say it is dumb (someone, do please go scan a pound banknote and put it up to Wikipedia). Anyway, luckily enough there was a photoshopped version with some guy instead of Queen Elisabeth available. Funny indeed, it does say "promise to pay", but it's slightly different from what I was talking about, because that promise "explains" a pound bill in terms of pounds, which is somewhat circular and not very revealing. Oh, I've just found out that the "pink paper" systems actually do exist in reality and work exactly as described. LETS is the name of these.